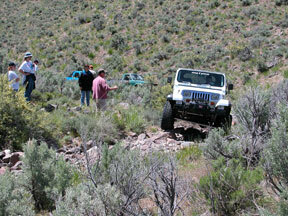 Memorial Day Weekend every year is the time to join the Bangin' Bones 4WD Club for their annual Memorial Day Wild Weekend of four wheeling and fun! Located in Elko, NV, the Bangin' Bones folks have some great wheeling and fantastically surprising wonderful scenery and ghost town adventures. I thoroughly enjoyed the trip and the hospitality of the club and the folks of Elko, NV. 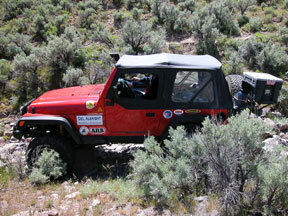 The really good news is that Elko is becoming a motorized recreation destination. They LIKE us there. Pay a visit. 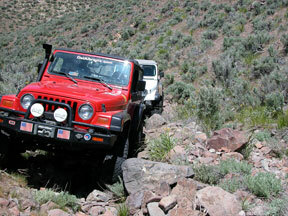 And if you get the chance, sign up for their Annual Wild Weekend as it's a lot of fun and great wheeling. See pics. 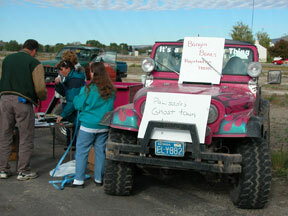 The Bangin' Bones club registration was just outside town, after you checked in at a local hotel/casino. Everything was organized and well run. 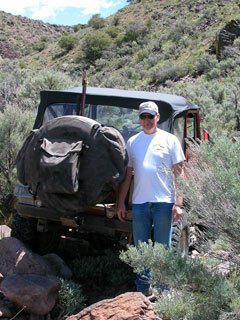 Britt Blakeman, President of the club, poses along side his rig on our 4+ trail. As with any four-wheeling event, there's always a crowd to cheer you on as you negotiate obstacles. Oh, and they help stack rocks too! The rocks on the hard trails tended to move a lot, and I had to learn new techniques for this type wheeling. The weather was great and we had beautiful blue skies for the whole weekend. 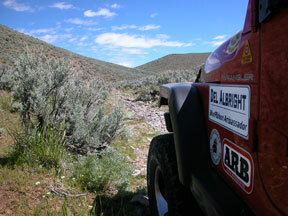 Much of the harder trails are out in the sage brush country. We stayed on the trails.